The lens barrel is heavy, made of metal. The lens mount is metallic and features a rubber gasket to prevent water from entering the camera chamber throughout the lens mount. 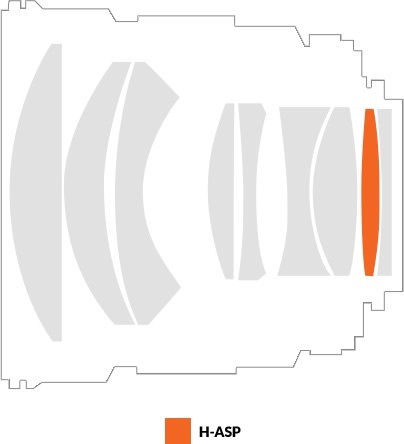 Samyang lenses feature hard infinity stop following a variable infinity region designated by an "L" marking on the lens. A precisely calibrated lens allows to quickly set the focusing distance on infinity without looking at the distance scale. It is especially handy feature for night time and astrophotography because simply there’s no enough light to focus accurately through the viewfinder. Unfortunately the distance scale of Samyang lenses is often misaligned and sometimes the lens reaches infinity focus BEFORE the corresponding mark. With Samyang lenses, one of the first recommended tasks is to check if the infinity mark and the entire distance scale are accurate. Find experimentally the true position of infinity and make a small mark on the distance scale. The lens uses screw-in filters with standard size of 72mm. Such filters are expensive and mainly used with professional lenses. The round bayonet-type lens hood attaches to the bayonet fitting on the front of the lens barrel and locks in place with a twist. After usage, the lens hood can be mounted in reverse for transportation or storage.